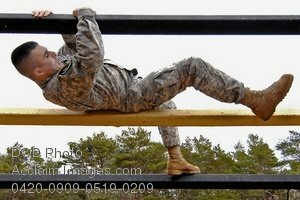 Description: Free, public domain image: National Guard Soldier Negotiating the "Weaver" Obstacle During a Soldier of the Year Competition. Staff Sgt. Jesse Ginestar negotiates the "weaver" obstacle during the Oregon National Guard’s 2009 Soldier of the Year/NCO of the Year competition, Feb. 27-March 1, at Camp Rilea, Warrenton, Ore. Ginestar, of Klamath Falls, Ore., who is a platoon sergeant with Charlie Troop, 1st Battalion, 82nd Cavalry, won the title of the Oregon National Guard's 2009 NCO of the year.